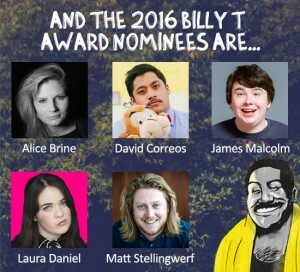 Solid growth of emerging talent in New Zealand’s comedy industry leads to a record-breaking 28 applicants vying to get a nomination for the 2016 Billy T Award. 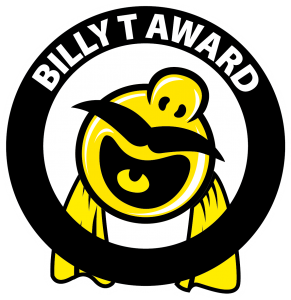 Over the last two nights, 2015 Billy T Award winner Hamish Parkinson whipped the audiences into a frenzy, welcoming the 28 exciting comedians from across the country on to the stage at The Classic Comedy & Bar in Auckland. These budding talents absolutely stormed it, displaying a diverse range of hilarious material and points of view. Making the exceptionally difficult decisions, last night were this year’s expert panel of five judges, who have a wide range of combined experience across the comedy, television and theatre industries. There was a huge diversity of creative ideas that were presented in the pitches, and performances onstage were innovative and electrifying over the two nights. With a surge of fresh talent coming through, the New Zealand comedy scene is in great shape. 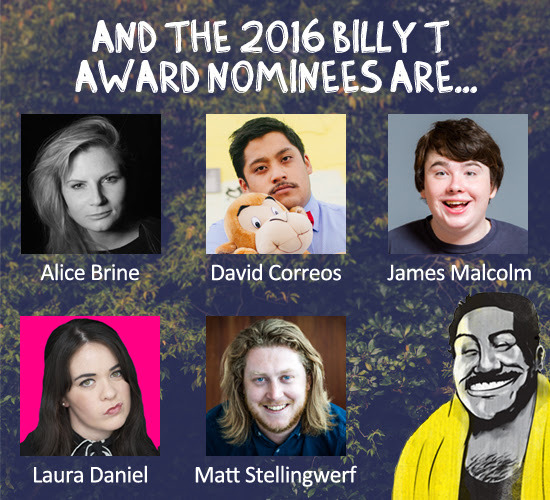 The nominees for the 2016 Billy T Award are selected on their proven comedic ability; talent; dedication; current form and outstanding potential, and will be judged on all aspects of their 2016 NZ International Comedy Festival show. Final performances and the award presentation will happen at Last Laughs on Sunday 15 May 2016. Comedians from both Islands are represented in this year’s nominees, with finalists from Wellington, Auckland and Christchurch. Billy T James changed the face of comedy in this country, forging a hugely successful career out of making people laugh. To celebrate his memory and achievements, the New Zealand Comedy Trust created the annual Billy T Award to support up-and-coming comedians with the outstanding potential to take their comedy career to the next level. The inaugural winners of the Billy T Award in 1997 were Ewen Gilmour & Cal Wilson. ← Shakespeare’s famous Globe Theatre will rise again … in Auckland.